Name Variation Walter Hillmer was also known as Hillmer. Walter Hillmer married Mildred Rau Meyer, daughter of Herman Meyer and Louise Wacholz. Name Variation Pauline Meyer was also known as Paulina. Married Name 17 June 1933 As of 17 June 1933,her married name was Lehman. Pauline Meyer was born on 21 October 1904 at Wisconsin. She was the daughter of Herman Meyer and Louise Wacholz. Pauline Meyer died on 12 April 1989 at age 84 Mrs. Pauline Meyer Lehman, age 84, of Baraboo passed away Wednesday morning, April 12, 1989 at her home on Manchester street. She was the daughter of the late Herman and Louise Meyer. She was born on Oct 21, 1904 in Reedsburg. She married Carl Lehman on June 17, 1933. They celebrated their 50th wedding anniversary in June of 1983. Mrs. Lehman was employed by Island Woolen Mills until it closed and was then employed by McArthurs Hammock Factory for 22 years until her retirement. She was a member of St. John's Lutheran Church. Survivors include her husband, Carl Lehman of Baraboo, one son, Arthur (Elaine) Zinkie of Baraboo, two grandsons, Thomas (Cathy) Zinkie of Baraboo, Steven (Denise) Zinkie of Yorkville, Ill., two great grandchildren, Gregory and Stephanie Zinkie of Baraboo, two sisters, Pearl (Emil) Meyer of Reedsburg, Loretta (Albert) Ziech of Seely Lake, Mont. and many nieces, nephews, relatives and friends. She is preceded in death by her parents, Herman and Louise Meyer, two brothers, Rudolph and Edward Meyer and one sister, Mildred Hillmer. Funeral services will be held Friday, April 14 at 2 p.m. at St. John's Lutheran Church with Pastor Daniel Balge officiating. Burial will be made in the Walnut Hill Cemetery. Friends may call on Thursday from 7 to 9 p.m. at the Redlin Funeral Home and on Friday from 1 p.m. to time of services at the church. Taken from the Baraboo News Republic. [S243] U.S. Federal Census 1920 U.S. Federal Census, by Ancestry.com, ED175. Dwelling 202. Married Name Her married name was Ziech. Loretta Meyer was born on 8 May 1918 at Wisconsin. Loretta Meyer died on 14 September 1999 at age 81. 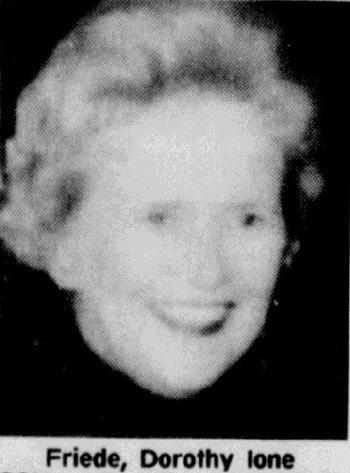 Loretta Meyer obtained US Social Security Card at Wisconsin; last residence Seeley Lake, Missoula, Montana. Name Variation Edmund Meyer was also known as Edward. Edmund Meyer was born on 16 January 1911 at Wisconsin. He was the son of Herman Meyer and Louise Wacholz. Edmund Meyer died in March 1986 at age 75. Rudolph Meyer was born circa 1903 at Wisconsin. Rudolph Meyer died between 1971 and 1989. John S. Babb was born on 29 July 1866 at Wisconsin. He was the son of Philip Henry Babb and Hannah Thornton. John S. Babb married Stella M. Richardson circa 1895. John S. Babb died on 10 March 1947 at age 80. [S245] U.S. Federal Census 1900 U.S. Federal Census, by Ancestry.com, Year: 1900; Census Place: Reedsburg, Sauk, Wisconsin; Roll: T623_1816; Page: 5B; Enumeration District: 143. Married Name circa 1895 As of circa 1895,her married name was Babb. Stella M. Richardson was born on 31 March 1877 at Wisconsin. She married John S. Babb, son of Philip Henry Babb and Hannah Thornton, circa 1895. Stella M. Richardson died on 4 October 1951 at age 74. Stella M. Richardson had 3 with 3 living in 1900 children. Name Variation Dorothea Dutte was also known as Dora. Name Variation Dorothea Dutte was also known as Lora. Married Name 15 March 1877 As of 15 March 1877,her married name was Baldner. Dorothea Dutte was born on 22 October 1855 at Hanover, Germany. She married Lewis Ludwig Baldner on 15 March 1877. Dorothea Dutte died on 18 February 1923 at age 67. 1895 Iowa State Census, Mitchell, Iowa Dorothea Dutte appeared on the census of 1895 in the household of Lewis Ludwig Baldner at Iowa State Census, Mitchell, Iowa. [S246] U.S. Federal Census 1880 U.S. Federal Census, by Ancestry.com, ED314. Dwelling 93. Henry David Baldner was born on 4 January 1878 at Mitchell, Iowa. He was the son of Lewis Ludwig Baldner and Dorothea Dutte. Henry David Baldner died on 3 February 1970 at California at age 92. 1895 Iowa State Census, Mitchell, Iowa Henry David Baldner appeared on the census of 1895 in the household of Lewis Ludwig Baldner at Iowa State Census, Mitchell, Iowa. Name Variation Philip John Baldner was also known as Philipp. Philip John Baldner was born on 29 December 1879 at Mitchell, Iowa. Philip John Baldner died on 27 June 1962 at age 82. 1895 Iowa State Census, Mitchell, Iowa Philip John Baldner appeared on the census of 1895 in the household of Lewis Ludwig Baldner at Iowa State Census, Mitchell, Iowa. Martin Fredrich William Baldner was born on 3 November 1881 at Mitchell, Iowa. Martin Fredrich William Baldner died on 3 March 1954 at age 72. 1895 Iowa State Census, Mitchell, Iowa Martin Fredrich William Baldner appeared on the census of 1895 in the household of Lewis Ludwig Baldner at Iowa State Census, Mitchell, Iowa. Married Name 1948 As of 1948,her married name was Friede. Dorothy Ione Adams was born on 24 July 1930 at Linden, Wisconsin. She was the daughter of Curtis Adams and Alice E. Orvis. Dorothy Ione Adams married Kenneth Arnold Friede, son of Reinhold Henry Herman Friede and Frieda E. Mathis, in 1948 at Madison, Dane, Wisconsin. Dorothy Ione Adams died on 15 May 1993 at Wisconsin at age 62 Dorothy Ione (Adams) Friede obituary. Amos Theodore Droes married Doris Ona Thompson. Amos Theodore Droes was born on 2 March 1907 at Sauk, Wisconsin. Amos Theodore Droes died on 23 July 1979 at Bay, Michigan, at age 72. Name Variation Nicholas Henry Luehrsen was also known as Nick. Name Variation Nicholas Henry Luehrsen was also known as Nicholaus Henry. Name Variation Nicholas Henry Luehrsen was also known as Luhrsen. Name Variation Nicholas Henry Luehrsen was also known as Luherson. Nicholas Henry Luehrsen was born in October 1855 at Wisconsin also reported as New York. He was the son of John Christopher Luehrsen and Christina Ensh. Nicholas Henry Luehrsen married Anna Dorothea Nieman, daughter of Jurgen Heinrich Nieman and Catherine Dorothea Kohlmeier, on 3 November 1878. Nicholas Henry Luehrsen died on 10 March 1944 at age 88 Funeral services for Nicholaus Luehrsen, 88, resident of this city for many years, who died Friday at the home of his daughter, Mrs. F. W. Droes, will be held at 2 p.m. Monday in the Gant funeral home. The Rev. C. P. Melcher, of the First Presbyterian church, will officiate. Burial will be in the Greenwood cemetery. He is survived by the daughter; a son, Alfred, Milwaukee; five grandchildren, and nine great-grandchildren. He was buried after 10 March 1944 at Greenwood Cemetery, Reedsburg, Sauk, Wisconsin. [S248] U.S. Federal Census 1860 U.S. Federal Census, by Ancestry.com, Page 198. Dwelling 1474. [S247] U.S. Federal Census 1870 U.S. Federal Census, by Ancestry.com, Page 23. Stamp 295. Dwelling 173. [S246] U.S. Federal Census 1880 U.S. Federal Census, by Ancestry.com, NA Film Number T9-1446 Page Number 289B. [S245] U.S. Federal Census 1900 U.S. Federal Census, by Ancestry.com, ED149. Dwelling 109. [S244] U.S. Federal Census 1910 U.S. Federal Census, by Ancestry.com, ED111. Dwelling 69. [S243] U.S. Federal Census 1920 U.S. Federal Census, by Ancestry.com, Year: 1920;Census Place: Reedburg Ward 1, Sauk, Wisconsin; Roll: T625_2015; Page: 13A; Enumeration District: 174; Image: 360. [S250] U.S. Federal Census 1930 U.S. Federal Census, by Ancestry.com, Year: 1930; Census Place: Reedsburg, Sauk, Wisconsin; Roll: 2609; Page: 11A; Enumeration District: 29; Image: 336.0. Name Variation Anna Dorothea Nieman was also known as Annie. Married Name 3 November 1878 As of 3 November 1878,her married name was Luehrsen. Married Name 3 November 1878 As of 3 November 1878,her married name was Luherson. Anna Dorothea Nieman was born on 7 March 1860 at Varendorf, Hanover, Germany. She was the daughter of Jurgen Heinrich Nieman and Catherine Dorothea Kohlmeier. Anna Dorothea Nieman married Nicholas Henry Luehrsen, son of John Christopher Luehrsen and Christina Ensh, on 3 November 1878. Anna Dorothea Nieman died on 30 April 1936 at age 76 Funeral services for Mrs. Nicholas Luehrsen, 76, a resident of this community since 1879, were held Sunday, May 3, 1936, from the Presbyterian church, with the Rev. H. B. Foster, officiating. Mrs. Luehrsen had been an invalid for 15 years. She is survived by the widower, a daughter, Mrs. F. W. Droes, and a son, Alfred, all of this city, besides other relatives. She was born in Germany and came here in 1870. She married Mr. Luehrsen on Nov. 3, 1878. She was buried after 30 April 1936 at Greenwood Cemetery, Reedsburg, Sauk, Wisconsin. Port of Departure: Hamburg, Germany. Anna Dorothea Nieman had 3 with 2 living in 1900 children. She had 2 with 2 living in 1910 children. Name Variation Alfred Luehrsen was also known as Alford. Name Variation Alfred Luehrsen was also known as Luherson. Alfred Luehrsen was born on 1 January 1886 at Wisconsin. He was the son of Nicholas Henry Luehrsen and Anna Dorothea Nieman. Alfred Luehrsen died in January 1973. Alfred Luehrsen obtained US Social Security Card at Wisconsin; last residence Hustler, Juneau, Wisconsin. Name Variation John Christopher Luehrsen was also known as Christopher. Name Variation John Christopher Luehrsen was also known as Johan Christoph. Name Variation John Christopher Luehrsen was also known as Luhrsen. Name Variation John Christopher Luehrsen was also known as Christofer. John Christopher Luehrsen married Christina Luback at first marriage for him. John Christopher Luehrsen was born on 12 September 1822 at Hanover, Germany. He married Christina Ensh before 1854 at second marriage for him. John Christopher Luehrsen died on 20 October 1903 at age 81. [S246] U.S. Federal Census 1880 U.S. Federal Census, by Ancestry.com, ED265. Dwelling 59. Name Variation Christina Ensh was also known as Christine. Married Name before 1854 As of before 1854,her married name was Luehrsen. Married Name before 1854 As of before 1854,her married name was Luhrsen. Christina Ensh was born on 30 June 1826 at Hanover, Germany. She married John Christopher Luehrsen before 1854 at second marriage for him. Christina Ensh died on 22 September 1917 at age 91. Name Variation Louisa Luehrsen was also known as Elizabeth. Louisa Luehrsen was born circa 1854 at New York. She was the daughter of John Christopher Luehrsen and Christina Ensh. Name Variation Frederick W. Luehrsen was also known as Fred. Frederick W. Luehrsen was born on 21 February 1857 at Wisconsin. Frederick W. Luehrsen married Sarah Colling, daughter of Daniel Colling and Sophia Gerss, in 1880. Frederick W. Luehrsen died on 20 November 1935 at age 78.
of Christopher and Christina (Ensh) Luhrsen. removed to Westfield Township, Mr. Luhrsen there purchasing a farm. of his life and died in 1906, at the age of eighty-four years. Mrs.
whom all are living except William. attractive residence, located at No. 628 Main Street. Politically Mr.
and the latter in 1891, when eighty-one years of age. Mr. and Mrs.
years. His life is a lesson of industry, frugality, honesty and good humor. Name Variation Anna Luehrsen was also known as Annie. Anna Luehrsen was born circa 1859 at Wisconsin. Married Name 2 March 1881 As of 2 March 1881,her married name was Licht. Emma Marie Luehrsen was born on 20 January 1861 at Wisconsin. Emma Marie Luehrsen married Johann Wilhelm Licht, son of Heinrich Wilhelm Licht and Catharine Sophie Jurgens, on 2 March 1881. August Luehrsen was born circa 1863 at Wisconsin. Name Variation William Luehrsen was also known as Wilhelm. William Luehrsen was born circa 1866 at Wisconsin. William Luehrsen died before 1918. Name Variation Edward C. Luehrsen was also known as Luhrsen. Edward C. Luehrsen was born on 17 July 1869 at Wisconsin. Edward C. Luehrsen married Emilie Schuette, daughter of Johann Juergen Wilhelm Schuette and Dorothea Reinecke, circa 1892. Edward C. Luehrsen died on 16 December 1939 at age 70. Emil Sinner was born in March 1865 at Germany. He married Sophia C. Walz, daughter of John G. Walz and Mary D. (? ), on 10 April 1895 at Monroe, Wisconsin. Emil Sinner died after 1930. Emil Sinner immigrated in 1888. In 1890 SINNER, Emil; Farming and Stock, Section 21, Ridgeville Township, Norwalk P. O., came to Monroe County in 1890. [S245] U.S. Federal Census 1900 U.S. Federal Census, by Ancestry.com, ED105. Dwelling 101. [S244] U.S. Federal Census 1910 U.S. Federal Census, by Ancestry.com, ED84. Dwelling 89. James Shanks Towers was born on 24 April 1859 at Caledonia, Columbia, Wisconsin. He was the son of John Towers and Marion Shanks. James Shanks Towers married Margaret C. McLeish on 10 December 1884 at Caledonia, Columbia, Wisconsin. James Shanks Towers died before September 1918. [S245] U.S. Federal Census 1900 U.S. Federal Census, by Ancestry.com, ED2. Dwelling 48. [S244] U.S. Federal Census 1910 U.S. Federal Census, by Ancestry.com, ED11. Dwelling 203. Married Name 10 December 1884 As of 10 December 1884,her married name was Towers. Margaret C. McLeish was born on 14 March 1857 at Caledonia, Columbia, Wisconsin. She married James Shanks Towers, son of John Towers and Marion Shanks, on 10 December 1884 at Caledonia, Columbia, Wisconsin. Margaret C. McLeish died after September 1918. Margaret C. McLeish had 5 with 5 living in 1900 children. She had 6 with 6 living in 1910 children. Married Name Her married name was Stewart. Florence Towers married William E. Stewart. Florence Towers was born on 18 May 1886 at Caledonia, Columbia, Wisconsin. She was the daughter of James Shanks Towers and Margaret C. McLeish. Wallace William Towers was born on 1 January 1891 at Caledonia, Columbia, Wisconsin. He was the son of James Shanks Towers and Margaret C. McLeish. Wallace William Towers married Amanda Shrieber on 16 July 1913 at Greenfield, Sauk, Wisconsin. Wallace William Towers died before September 2001. On 5 June 1917 at World War I Draft Registration, Columbia, Wisconsin, reported 2 children.